Offering a 24 hour a day callout service to all of our customers is a fundamental part of our businesses core activities, giving our clients peace of mind that engineering support is always on hand either in emergency or for routine maintenance. We are able to provide a solution to almost all fire, security and electrical requirements, working together with the customer and manufacturers to find a bespoke solution in some circumstances. 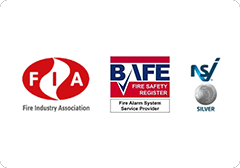 To maintain compliance with the current British Standards we are accredited by the NSI and BAFE SP203 for all aspects of fire alarm systems, the NSI for Intruder, access control and CCTV. We provide our service across the south west have a regular engineering presence in Exeter, Torquay, Yeovil, Taunton, Weston-Super-Mare and Bridgwater for all of our fire, security and electrical services. With our engineering experience in all the services we offer our customers are always safe in the knowledge that they will be provided with an efficient and economical service with customers requirements the foremost important factor. Our staff are all security vetted to BS7858 and our on site staff are trained in asbestos awareness. Where applicable staff also hold IPAF licences for operating access equipment and a CSCS card.